ADG Grenada is always looking for volunteers! Volunteer long-term for special positions, sign up for a specific program, help out a certain community, or volunteer while on vacation! We need dedicated people like you to help the communities of Grenada! 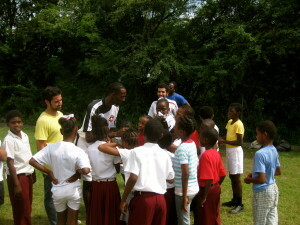 Coming to Grenada’s communities to volunteer and make a difference is very important! Volunteers make a huge difference to all our children’s’ programs in Grenada. ADG Grenada is a small organization that relies on donations and volunteers to make all of our programs possible. Volunteer for a special long term position! Interested in volunteering for a special position with ADG Grenada? Please email adgrenada@gmail.com with your resume and a letter of interest. Thank you! Volunteer for your local community! 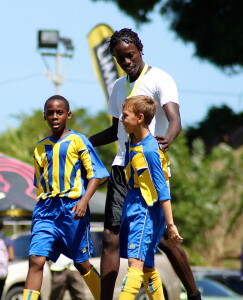 Currently ADG Grenada is seeking volunteer coaches locally to help children in Grenada. All experienced coaches will conduct clinics, monitor practices, and work closely with other volunteer coaches and players to improve skills and reach more youths in different communities. Volunteer as a visitor from another country! All visiting volunteers can come for any length of time, can choose which programs they would like work with (separated by age, gender, and skill level), and still have time to enjoy the local culture and beaches of Grenada during their stay. N.B. ADG Grenada visiting volunteers are responsible for their flights, their room and board during their stay, and assume all liability for themselves and their belongings. If you can’t make it to Grenada or want to continue your support after you leave, help us out from home! Interested in volunteering to help ADG Grenada from your home country? Find out how to organize an equipment drive or sign up to be part of our team of coordinators.